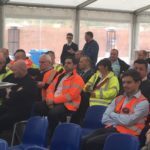 On Thursday 30th March 2017 38 delegates attended a very successful IDE Midlands Regional meeting held at the Armac Quarry and sponsored by Volvo Construction Equipment. Representatives from Volvo carried out a presentation to introduce their latest factory produced High Reach, the V380, which was also on display at the event. 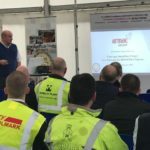 Richard Dolman, FIDE, A R Demolition Ltd followed with a presentation on the new Demolition Safety Association website and app which received a mixed response from the audience. 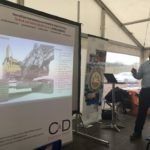 The final presentation, from Adrian McLean FIDE, Armac Demolition Ltd, spoke of the hazards and pitfalls Demolition Engineers are likely to experience on site. The meeting closed with a Q & A session from the floor. The IDE wishes to express their thanks to both the hosts and sponsors for the success of this event and the very popular “fish and chip” supper that was kindly provided to all attendees.